Nature lovers will be able to enjoy the luxury camping experience of a lifetime at Padova. The campsite is nestled in a picturesque cove and overlooks an enchanting sandy beach that comes complete with private access for guests. If you want to make this your next holiday destination, simply book your stay during LuxCamp. The enchanting Rab Island is just waiting to be explored and special sightseeing trips are available on request. Adults also have the option of exploring alone if they wish, while the kids will be entertained with a wide range of activities that are offered by the staff that lead the mini club. The staff at Padova organise daily aqua aerobics classes and this is a great way to get fit and have fun while making new friends. Swimming lessons are also provided for guests of all ages so that they can get the most out of this stunning seaside location. 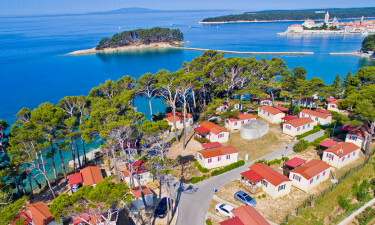 A 250-metre stretch of sand and pebble beach is located right on the edge of Padova and guests can walk there from their modern mobile home in just a couple of minutes. The beach is lapped by clear aquamarine water, which is a popular play to try kayaking and other types of water sports.